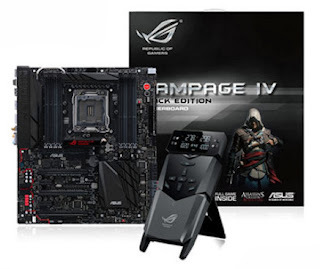 TechnoProzium: ASUS Rampage IV Black Edition: The Dark Dreadnought! ASUS Rampage IV Black Edition: The Dark Dreadnought! Right now if you are looking for the ultimate performance in a desktop system, your options are quite limited. With AMD not pursuing the performance crown anymore, Intel is left battling itself for quite sometimes in the high-end enthusiast segment. So when it comes down to choosing a platform for your next HEDT (High-End Desktop) build, it’s either Intel’s mainstream socket LGA1150 or the higher-end socket LGA2011. With the later, you will not only get the chance to opt for Intel’s 6core/12thread Ivy Bridge-E CPUs but you’ll also encounter some of the finest (and largest!) samples of motherboard engineering. Take a look on the new Rampage IV Black Edition and you'll know what I'm talking about! ASUS is one of the biggest names in the PC market and it’s no secret that their Republic of Gamers line-up represents some of the best build-qualities and feature-sets found in consumer hardware space. ROG branded motherboards often set a standard of their own and we don’t expect this new motherboard to be an exception to that rule. What makes this x79 chipset based mainboard special however is the fact that it’s a “Black Edition” motherboard - a rare incarnation even among the ranks of the ROG! 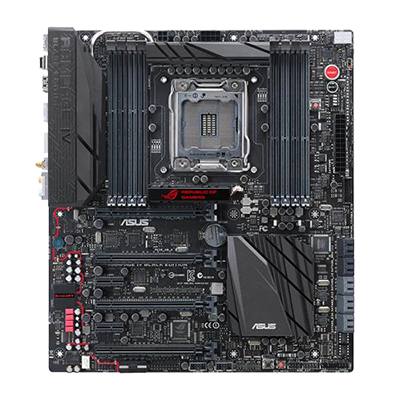 Instead of the traditional red n black treatment, ASUS has given this one a rather sinister looking black theme with traces of gray and red. Like many of its LGA2011 brethren, Rampage IV black edition is based on an E-ATX form factor and features a quad channel memory subsystem with 4 DIMM slots located at each sides of the CPU socket making it a total of 8 DIMMs capable of supporting up to 64GB of DDR3 RAM. For a gamer however, the benefits of a build based on x79 chipset lies elsewhere! It’s those 40 PCIe lanes provided by the Sandy Bridge-E/Ivy Bridge-E processors that often lure enthusiasts looking for an uncompromising muti-GPU gaming rig! With Rampage IV black edition, you can go for a two way AMD CrossFireX or Nvidia SLI in a full x16 + x16 mode or even a tri/quad-GPU set-up without worrying about bandwidth limitation! ASUS has thrown in a free copy of Assassin's Creed IV: Black Flag game for good measures which seems to be a very appropriate choice for a black edition bundle! As you can see, ASUS has left no stones unturned as far as features and functionalities are concerned! You get a total of 10 SATA ports, 8 USB 3.0, Wi-Fi and Bluetooth 4.0, discrete level SupremeFX Black audio solution along with all the BIOS and software implementations that we’ve come to expect from a high-end ROG product. 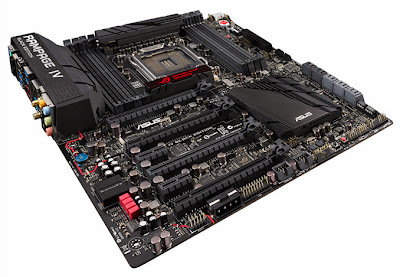 The motherboard itself is built from very high quality components like 60A chokes & 10K black metallic solid-state capacitors and bears a relatively clutter-free layout. Cooling is more than adequate and heatsinks/heatpipes are also placed conveniently. You also get the “OC Panel” – a very unique and versatile overclocking tool. The support for PCI Express 3.0 is also there – native and fully validated. Now here is something important that you should take into account when considering an LGA2011 build! With no native USB 3.0 support and only 2 native 6Gbps SATA (SATA3) ports, X79 (Patsburg) no longer represents the cutting-edge of chipset technology; that honor goes to more modern chipsets like the LGA1150. This is platform here that was originally released along with Sandy Bridge-E series of processors more than two years ago and unlike its mainstream counterparts the x79 chipset never got its due refresh! 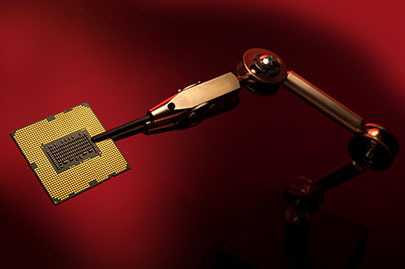 While we here at Technoprozium aren’t big fans of Intel’s policy of introducing new sockets and chipsets at every other opportunity, we can’t ignore the fact that this flagship platform is getting a bit long in the tooth – specially in the connectivity (I/O) front! To its credit however, ASUS has done its best to offset these limitations by deploying all shorts of third party chips and controllers. Rampage IV Black Edition is now available in India and sells for a staggering Rs.35K according to ASUS! With that kind of money you could probably assemble an entire entry-level desktop PC or even buy a budget laptop! But let’s not forget that this is not a component for your run-of-the-mill builds. This is the kind of a motherboard you form an empire on, not just build a system! Anything short of an overclocked i7 4930K paired with couple of R9 290s will be regarded as severe injustice of a motherboard of this caliber! Enthusiasts considering this black beast are looking for a no holds bar multi-GPU monstrosity or even gunning for a few world-records. If you don’t see yourself doing any of that and prefer value and efficiency over bragging rights then your money is better spent on a mainstream socket LGA1150 system.